I spent the 4th of July at this tree house with Michael and Abigail. It was unbelievable. Many of my friends have been here before and I have seen so many pictures but it is worth the drive to experience it for yourself. -The tree house is in right outside of Cookeville, Tennessee. -It was built by Horace Burgess, a part-time landscaper/part-time tree-house builder. -He has spent almost 20 years on this project, after being inspired to begin in 1993. -As the story goes, "I was praying to God and he said, 'If you build me a tree house, I will get you all the supplies." -20 years worth of passion, he has actually only put $14,000 into this project. -It is 10 stories tall (100 feet) and about 10,000 square feet inside. -The tree house has structural support on the ground but it also uses the support of 7 trees. One of the trees is an 85 foot massive oak tree. -He has put over 258,000 nails into the house. -It has over 80 rooms. -No blueprints involved, just inspired by God. -There is actually an architectural class working on making blue prints of this structure now. -Admission is totally free. He makes close to no money on this landmark. I bet if he started charging there would be some liability issues. That is probably why there are 'private property' and 'no trespassing' signs everywhere! -Horace believes that this tree house represents that we are the church and no structure can define it. -The tree house is going into the Guinness Book of World Records this year for the Biggest Tree House in the World. We heard some hammering coming from the top tower. I knew that Horace Burgess, the designer/builder, is still adding on to the house and I had a feeling it was him. Horace is pictured above putting flags up for the holiday. I snagged the picture of him below off the internet. We ran into him as we were climbing up one of the staircases. He was really friendly and walked up to me and said, "Hi, I am Horace, I built this house." He went on to tell us that he has poured 20 years into this project. It took 11 years to put the roof on. He emphasized that it was a labor of love. It has been a lot of labor but he loves it. 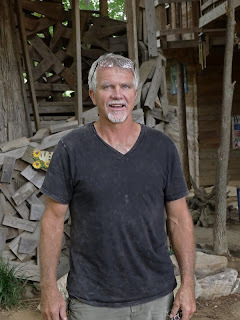 He is still adding on to the tree house today and hopes to build a gift shop to make his project self-sustaining. 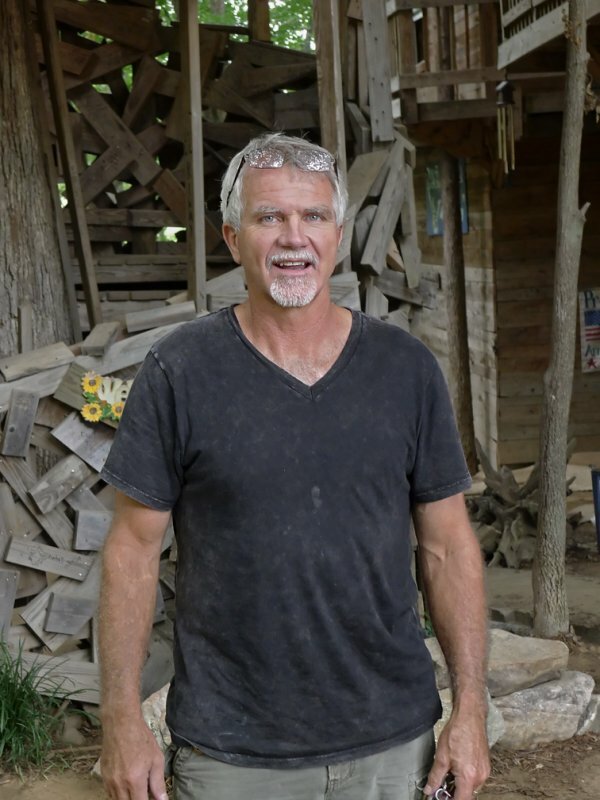 He is currently taking a year off of landscaping so he can put his efforts on the gift shop. After sharing his story he made sure to say that it warms his heart and he is so blessed that people like us show up. And then he walked off telling us to enjoy our visit. There was graffiti and signatures everywhere! From the tallest tower you can see the gardens. He made this as a gift for his wife, so when she is in the tallest tower she can see Jesus in the garden. There were so many nooks and crannies. We found one with a tiny swing in it. This is the balcony of the chapel. Below, there was huge chapel in the center of the tree house. After taking an hour to explore the tree house, we played hide n'seek. Definitely recommend it!